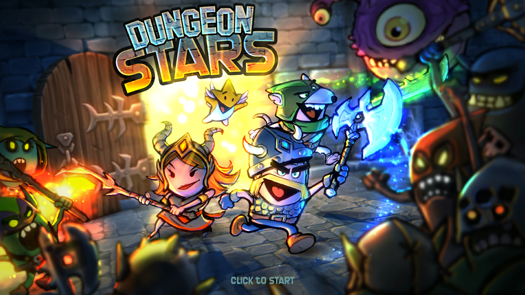 Upon receiving the invite to try out Dungeon Stars, a side scrolling hack & slash dungeon crawler, I got a bit excited because it brought to mind my experience playing the infamous side scroller game Golden Axe. I spent many a quarter and hours when I should’ve been studying playing that legendary game. 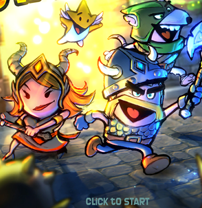 However with this game, while sharing a similar mode of that legacy, Riposte Games & Co and Furnace Games has managed to up the ante by creating a game that has the potential to create a large, devoted fan base of its own. Being that it’s still in Early Access, it does have a ways to go before being a finely polished product, but interaction with the developers assures me that they are looking for honest feedback to make it so. The game starts off with the three hero selections; a magic user, a roguish sword type, and a blunt weapon warrior. Each of these has their own set of skills that can be unlocked, and items that are specifically designed for the hero. Having only made it through a few levels with two of the starting heroes I cannot describe all of the items available. However I can tell you that the items are color-coded to match with the heroes color. The blunt weapon wielder heroes color is red and his items appear to be based off of rage, and along with his special skills which are accessed using the the X, Y, Z keys to trigger, greatly enhance his attack. The same goes for the sword hero’s color is green and his items plus scales appear to be based off of poison. I’ve yet to try the magic user, but her color is different than the other two. 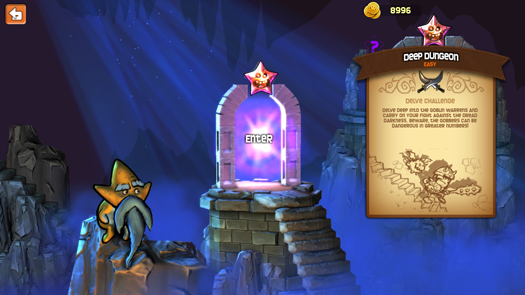 Once a starting hero is selected, the Star Portal must be entered in order to access the dungeons. There is a sage start sitting inside, giving hints on gameplay and what to do next to access the dungeons. Selecting the first Star portal triggers a prompt to enter, which when selected presents the player with a list of available dungeons. All are locked except the one that is available for the player to enter. 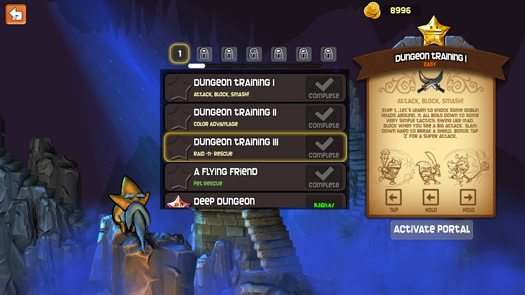 Once the dungeon is selected, the hero character and his stats are shown, as well as an overview of the multi-level dungeon. To start the gameplay, the battle button blinking below the hero image must be selected. The hero is placed on the first level of the dungeon and progresses forward to meet, attack and hopefully overcome the goblin waves. The hero continues forward until they either reach the end of the level or die. 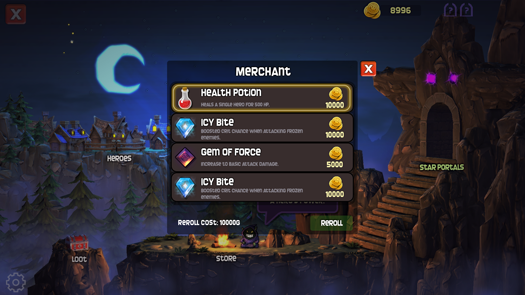 At the end of each level, the hero is given the opportunity to use a heal potion and equip any items won before attempting the next level If they die on any level before reaching the end, the whole dungeon is reset to the beginning. There are revive potions which can be purchased or obtained, but they appear to be rare and I’m not yet sure when they can be used. Gold currency is gained at the finish of each level which can be used to hel[ purchase level-ups or the store outside the Star Portals area. If at any time you leave the dungeon, it resets, and levels previously finished are reset. You do retain all items won, which does provide an opportunity for some farming, but that does not appear to be very effective for leveling up as one must also find artifacts for leveling. 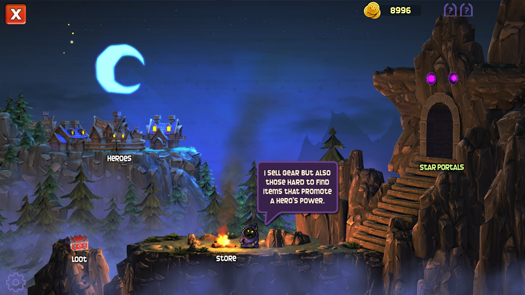 As the player’s hero progresses through the game, opportunities for treasure chests that contain gold, and items for the heroes. The items in the chest may not be for the current hero, you have to be aware of the color of the item. There is also opportunity as levels grow more difficult to unlock a new hero, as well as a pet that can help protect and/or enhance your attacks. 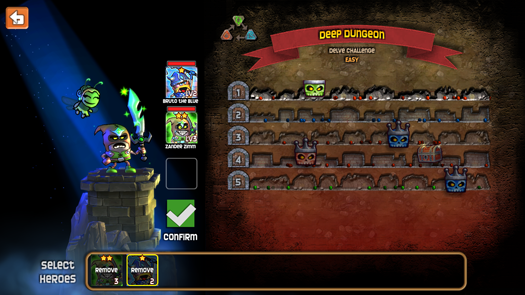 Each level in the dungeon becomes more difficult as tougher opponents are faced. 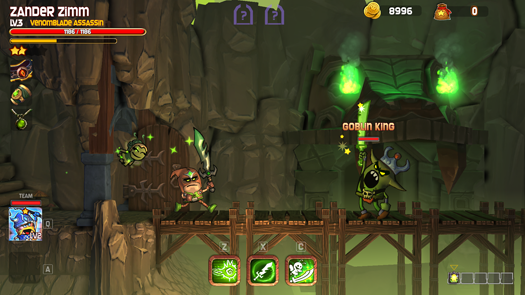 Once the dungeon level is started with a hero, they move forward without stopping until they are either killed by an opponent or reach the end of that level. 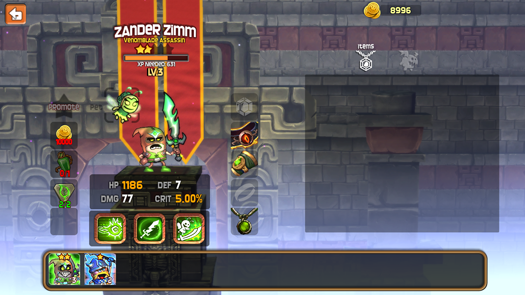 At the end of the level the hero is presented with opportunity to use a heal potion. 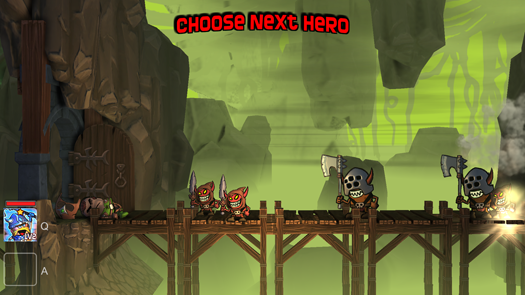 If the hero dies before reaching the end of the level, and there is no revive potion or other hero available, that session ends and the player must select heroes and and play from the start of the dungeon again. This is where I find a major issue with the game. I have an issue with this mechanic simply because as the game gets harder, even if you have a unlocked a second hero, they are generally very weak, have no items, and no pet to help them be effective against the higher-level dungeon levels. 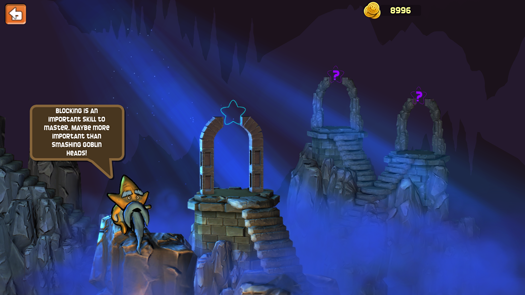 And even though one could possibly go outside of the star portal area and use the store to buy items, the fact that the hero that was unlocked is a level I and your original hero may be two or three levels above him and thus the dungeons are geared to that level rather than the level of the lowest hero. To me this is a balance issue because even on easy mode it’s very difficult to progress and the dungeons where the first hero trained are now blocked and can no longer be used to level up the weaker hero. I’m sure there’s some way to create a better balance, otherwise there’s gonna be a good bit of frustration with new players being introduced to this game. Which is a shame because it’s a very fun game of the mechanics simple and easy to pick up. One of the other issues I found is that the blocking was not all that effective. I do need not see a significant difference in the amount of damage taken when blocking versus just attacking. That, combined with the fact that you cannot heal while in the middle the battle, thus creates a situation where you either try to zerg-fest the level to finish or die and have to start the dungeon over again. Until you finish this dungeon, the next will not unlock, and the previous ones are no longer available to be farmed for level ups. While there may be opportunities I’ve overlooked that mitigate these conditions, I have spoken with the developer and feel assured that they will listen to player feedback. The game is in Early Access for a reason, and I honestly feel that this game could turn out to be beloved by more than a few. It loads quickly, has excellent graphics and has simple yet effective (except for the blocking) attack mechanics. I found it fun to play and look forward to keeping active it in my Steam library.